Jay Whittle looks at the social media reaction after Wigan Athletic pulled off a shock upset against Stoke City at the Britannia Stadium on Wednesday. Latics ensured that Stoke City’s winless run would continue for at least another few days with a ruling performance. Stoke were expected to be amongst the early pacesetters in the Championship but the Potters have had a difficult start to life back in the second-tier and are currently one of two Championship sides that are still without a win this season. Wigan moved to eigth in the league table with their win and are level on points with seventh placed West Brom. Latics have racked up seven points in their first four games, despite playing Championship heavyweights Sheffield Wednesday, Aston Villa and Nottingham Forest prior to last night. Wigan were sensational from start to finish in their outing at Stoke, and the 1,079 travelling fans certainly would have not been disappointed with Paul Cook’s side's display. And the Latics fans poured onto social media to share their delight after Wigan stunned the promotion-favourites. 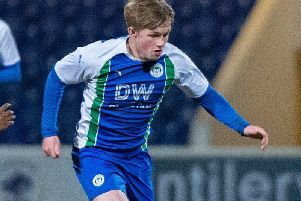 Latics’ first-team stars also took to social media after their mid-week triumph, with Paul Cook’s troops sharing the same joy as the fans for upsetting Stoke at the Britannia Stadium.